We knew that General Motors would be bringing out the new production version of the 2013 Chevrolet Camaro Hot Wheels Edition but the bigger surprise was a modified classic Camaro styled after one of the very first Hot Wheels toys from the late 1960s. Over the past few years, General Motors has used a Hot Wheels display to showcase the Camaro so it should come as no surprise that in debuting a production Hot Wheels Edition version, the bright orange “track” display was in full force for the 2012 SEMA Show. 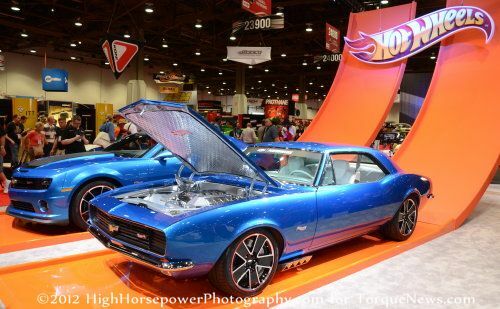 However, unlike previous events, GM had a dual display in Vegas to show off the metallic blue production Hot Wheels Camaro alongside a fully customized 1967 Camaro sporting a similar paint scheme. When the Hot Wheels lineup of die cast toys debuted in 1968, one of the original 16 vehicles was “the new” 1967 Chevrolet Camaro so for the 2012 SEMA Show the designers were tasked with building a full sized version of that original die cast toy finished in the same Kinetic Blue metallic paint as the Hot Wheels Camaro headed to production. On the outside, the 1967 Hot Wheels Camaro features some fairly subtle modifications such as the Hot Wheels logos on the grille, fenders and trunk lid along with shaved door handles. Where this 1967 Camaro is most unique (from a vintage production model) is the fully functional “Zoomie” side exit exhaust with massive rectangular tips poking from behind both of the front tires and a double hump hood similar to the one found on the original Hot Wheels toy. This unique 1967 Camaro also wears a set of 18 inch wheels with the redline design that is similar to both the original toy and the upcoming production Hot Wheels Camaro. What makes this 1967 Hot Wheels Camaro so cool is how much is resembles an actual vintage toy car. If you have played with any older Hot Wheels toys, you know that the undercarriage is finished in solid silver with a predominantly white interior and this custom Camaro offers those same features. The entire underside of the car is powder coated and/or painted silver just like a typical die cast toy while the interior surfaces including the doors, the carpeting, the dashboard and all of the seats are bright white and silver to create what is surely one of the brightest interiors at the massive Vegas show. This design harkens back to the interior of the old school Hot Wheels toys that were comprised of bare metal and white plastic but in the fine fashion of modern show cars – that silver and white interior finish is heavily clad in custom leather. The 1967 Chevrolet Performance Hot Wheels Camaro Concept was designed to celebrate the automaker’s long history with the famous toy brand but GM also used it to showcase their new emissions-compliant LS3 E-Rod “Connect and Cruise” powertrain system. This adds a 430 horsepower LS3 V8 (similar to the one in the current Camaro SS and Corvette base) mated to a 4L65 4-speed automatic transmission. This drivetrain is offered by Chevrolet Performance and comes with literally everything that a builder needs to take a custom car from a rolling chassis to a turnkey cruiser including the intake and exhaust systems (with catalytic convertors) as well as all of the electronics needed to bring this drivetrain to life. In following with the old school Hot Wheels theme, the underhood area of this custom 1967 Camaro is also finished entirely in silver – just like the engine bay of the original toy in 1968. Finally, because a SEMA Show car would be nothing if not modified everywhere, the 1967 Hot Wheels Camaro features a fully adjustable coilover suspension system, rack and pinion power steering and a Baer big brake package behind all four of the unique 18” redline wheels. For a closer look at the 2013 Chevrolet Camaro Hot Wheels Edition click here and for a closer look at the 1967 Camaro styled after the original Hot Wheels toy, click any of the thumbnails on the right side for a gallery of images from the 2012 SEMA Show! Very cool. My 13 year old has been a Camaro fan since Bumblebee in Transformers. This is smart marketing by GM.